The brand new Maggie Daley Park in Chicago has a climbing wall that is incedentally placed directly in front of the insurance company, Blue Cross Blue Shield’s headquarters. BCBS is also incedentally a proud supporter of JDRF, a childhood diabetes research non-profit. The new Maggie Daley Park in Chicago on the morning of 12-14-2014 in front of the BCBS building. I went to midnight mass and then this morning. Then I went into the City to shoot some photos for Christmas morning. There weren’t nearly so many homeless people out as I have encountered in past mornings. That’s a good thing because it shows that at least for this day they were getting a place to stay (I hope). But, even on a day like today, there are still people begging for help. I normally like to have some cash with me for such occasions, but today wasn’t one of them. I’m not the most cash rich person right now, but I have a job, a home, a car, and stuff to take pictures with. 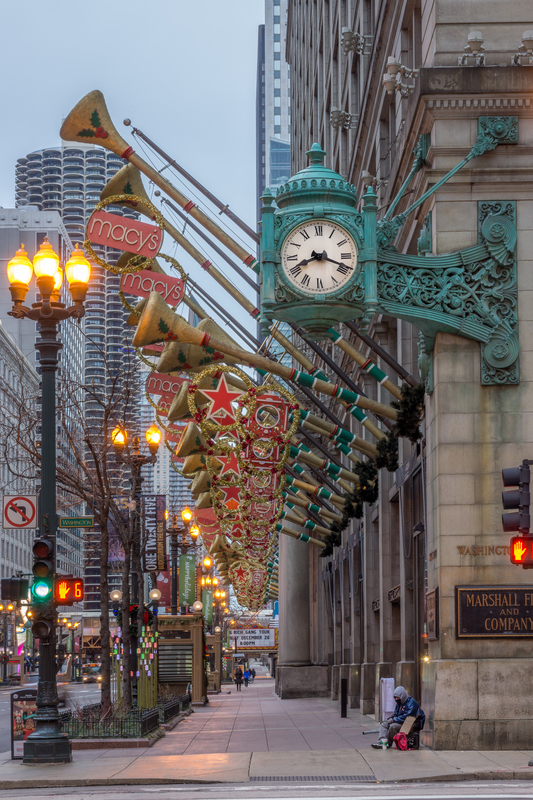 Christmas morning in Chicago outside of the old Marshall Field and Company store. On another note, this is the first time I posted something on twitter first. If you’re interested, you can follow me there too: https://twitter.com/adamddooley @adamddooley. In the middle of the day from the north end of the range. I spent two nights in the Tetons this summer. The first night, the clouds were good and thick. There were also good and thick in the morning, but I did get a rainbow. I was headed back to my campsite for the afternoon because I was up since 4 am. But as I got back I saw that the clouds were beginning to break up and become more interesting. Calder’s Flamingo in Chicago Federal Plaza is a really dynamic piece of art. In Chicago, if it weren’t for pieces like this all the harsh and imposing lines of the city would overwhelm you. But the amazing curves of the “Flamingo” with the shock of red in the midst of these black steel and glass buildings let’s you relax. Even the name of the location, Federal Plaza makes you stiffen up until you see this piece of art! Calder’s Flamingo in Chicago’s Federal Plaza has a reflection in the US Post Office. How did I shoot this photo? It was really formed with 7×2 HDR frames. That’s 14 frames with three photos each! (That’s 42 exposures combined.) I used Microsoft’s Image Composite Editor to stitch the photos together after I did the HDR processing in Photomatix. How did I get rid of all the people? I waited! I was very patient this evening. Since not every shot took up the whole width of the display, it’s not as if I had to wait for everyone to be gone from the whole plaza all the time, either.